The RHC was closed for three weeks in May, a much needed break for all of us. It was also a month for introspection and to see where we could improve. One of the suggestions was that the RHC will work through the year, with the staff taking breaks. We also designated Tuesdays and Thursdays for people coming in from more than 35 km. This will hopefully mean that the patient load is better distributed. Sharad delivered a healthyfemale baby after succesful Tubal Recanalisation. She had lost two young children to road accidents a year apart and the parents were understandably shattered. Luckily the recanalisation worked and both the baby and she are doing well. 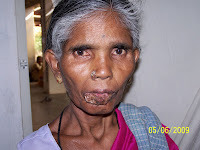 Sarojamma, has a Squamous Cell Carcinoma of the lip, brought about by years of betel nut chewing. How does one break this ubiquitous habit? Especially when it is used to stave off hunger pangs? April is the start of the new financial year, so in the middle of all accounts work, the RHC has to contend with an increase in patient load. 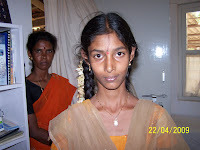 A Patient: Thejaswini was brought to the RHC with loss of weight, lassitude as well as recurrent fevers. A routine check revealed that she was Type I Diabetes Mellitus. She was put on Injection Insulin and has stabilised well with 22 units in the morning and 18 units at night. She is doing well. March is the last month of the financial year and that normally means more work in terms of stock taking, accounts etc. However this does not make any difference to the patients. Disease and infirmity do not make a distinction between the months of the year. 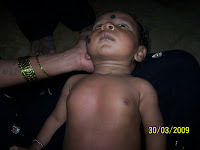 Some Patients: Sreenath 02 months, was brought to us by concerned parents because of the wheeze and stridor. He had LARYNGOMALACIA, for which there is no treatment. The baby grows out of it by the time he is a couple of years old. The video however is quite scary. A photo is also attached. Mohith Naik, 2 year old male had repeated fevers and was diagnosed here as recurrent Urinary Tract Infections, most likely due to a Posterior Urethral Valve. He was operated at CMC Vellore and is doing well. You can see the bladder opening in the abdomen, which will be closed subsequently.